The following programs leading to MA and PhD degrees are accepting applications for 2018-2019 academic year Fall semester. Contact names for each program have been provided for academic inquiries only. For administrative or procedure related questions, please contact Student Resources Office. Applicants must have completed their previous degree programs by August 29, 2018 at the latest. The applicant must submit ALES, e-ALES, GRE or GAT result during application. Applications without a valid exam result will not be taken into consideration. Candidates are required to submit their English proficiency exam scores (TOEFL IBT, e-YDS, YDS, KPDS, ÜDS, PTE Academic, CAE or CPE) during the application. Applicants who are unable to provide a valid English Proficiency Exam score can only be admitted to graduate study upon obtaining a satisfactory grade in Sabancı University English Language Assessment Exam (ELAE) offered following the application deadline. Those candidates who fail to attend or get a satisfactory grade in ELAE exam are obliged to attend and successfully complete English Language Preparation course(s) in order to enroll in a graduate program. Scholarships do not apply to the English Language Preparation courses. ELAE exam is not substituted for language exam in PhD applications. For PhD candidates exam results must be submitted during application; applications without these documents will not be taken into consideration. Graduates of Sabancı University are exempt from submitting an English Proficiency Exam score provided that they apply within two years of their graduation. For PhD applications, SU graduates are required to submit language certificate as well. April 20th, 2018 is the deadline for the applications. Applicants may be invited for written exams and/or interviews via e-mail. All written exams and interviews are held in English. For Turkish and international applicants who are abroad and unable to attend written exams and/or interviews, will be interviewed through Skype. * Candidates are going to be invited for the interview via e-mail. Online applications are accepted via http://admission.sabanciuniv.edu/. Application documents (official exam results, transcript, etc.) should be uploaded on the online system and application packages must be submitted either in person or posted to the address below. Please note that printout of the completed application form should also be added to the application package. The packages sent via mail must arrive at the department by the application deadline. Applications sent via e-mail are not accepted. Warning! 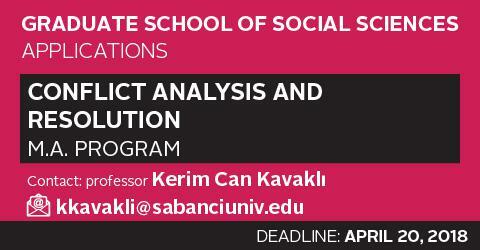 All the application documents become property of Sabancı University. It is suggested to keep the original reports of TOEFL, GRE, and ALES scores and apply with the copies of those test scores. However, please note that the originals must be produced at the time of registration to Sabancı University.